The Bernic Series 301 wall mounting enclosure is suited for sensors mounting. It is possible to mount 2 PCB’s. Standard colour is white/white but other colours can be supplied upon request. Enclosure with knob, for wall mounting, suitable for room themostats etc. The knob fits standard trimmer including the PCH215/30 from AB Electronik GmbH. Standard colour is white/black but other colours can be supplied upon request. The Bernic Series 900 wall mount enclosure with knob is suitable for room themostats etc. The knob fits standard trimmers including the PCH215/30 from AB Electronik GmbH. Standard colour is white/black but other colours can be supplied upon request. 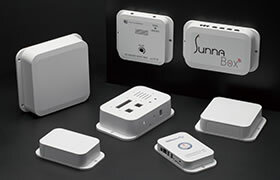 The Bernic Series 501 is a simple low cost flange mounted enclosure to be used for thermostats, replay boxes and similar. The Takachi TFW is a flanged wall mount enclosure manufactured in ABS. Available in 23 sizes and in 2 colors it is well suited for wireless communication device, controller, enclosed switch etc.